This page examples how we regularly work your one-off commission from supplied photographs, drawings, logo’s, business cards etc. We are also happy to research appropriate images based on your verbal description of how you envisage the end result. We tend to find that a lot can be achieved in just a ten minute telephone conversation, you will find us very easy-going and personable. Once we have discussed your requirements, we would apply ourselves to your design, focusing on every attention to detail and fulfilling your every request. Design Fees vary depending on your commission. Prices start from £50.00 inc. 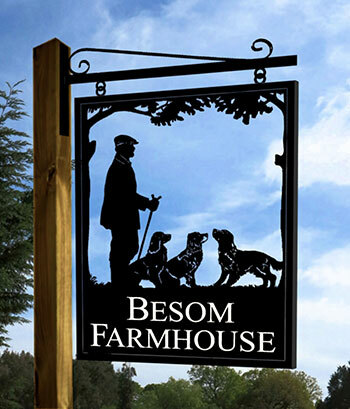 Above is a photograph taken by the wife of her husband posing in the garden with his stick, cap, followed by three photographs of his spaniels, - all for inclusion into their house sign. This is a typical example of what you design will look like, with all white areas being light transmitting cut-out detailing we will then await your confirmation or requested modifications. Once the design has been approved we then proceed with the manufacture of your commission by hand it to your approved design, then fabricating your commission in our workshop prior to galvanising, and powder coating to give the finished piece the ultimate in durability and delivered to your door. Grandfather farmer with grandchildren and dog photographs. Our weathervane portrait of him with his grandchildren and a very happy daughter. Happy young couple on safari. And they emailed me their photograph as the basis for their house sign (+ cat). This Highland Cow and calf classic scene. Was the basis for this large gaelic named farm sign (and weathervane). Carl Hester + Uthopia and on his way to an Olympic gold medal in the dressage. The Carl Hester weathervane we made for his riding school based on the photograph. This prize winning Limousin Bull photograph was sent to us to be used in a farm sign. 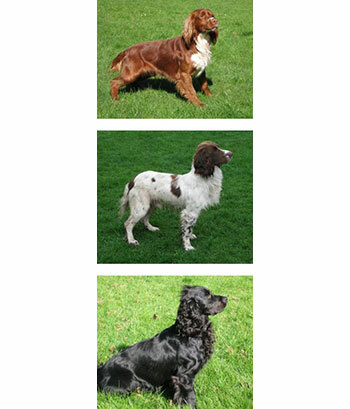 This customer emailed us a photograph of her coloured horse, dog and cat. From which we designed and made this farm sign for her. Barry Sheene after his last UK race at the Goodwood Revival in 2011, - on a Manx Norton b. From which I worked this very detailed weathervane of him. This customer used a large John Deere for his muck spreading business. We made him both a sign and a weathervane with the tractor and name on. This is part of of a painting showing Nelson's flagship, HMS Victory at the Battle Of Trafalgar. And this is the HMS Victory weathervane we made based on the painting. 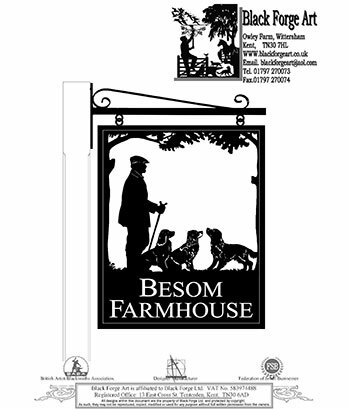 This returning customer had no qualms about supplying us with this sketch for their new farm sign. We subsequently made a pair of these signs for their new farm on The Isle Of Man. Ruth has an artist's studio on the Isle Of Bute off the West coast of Scotland with a spectacular view. So based on her emailed sketch laying out how she saw her sign we made this to hang outside her studio. Iconic landmark, The Angel Of The North on the outskirts of Newcastle, - makes me smile, - I'm on my way home. So I was more than pleased to get a commission to make a weathervane of it. This Danish farming couple were photographed by their children along with a large selection of their animals. 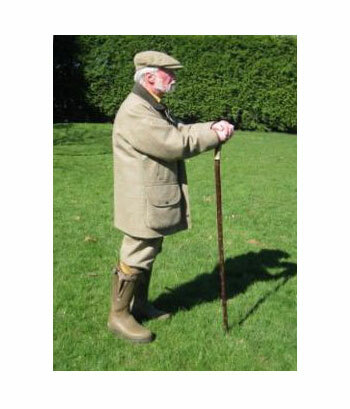 This long arrowed weathervane was the resultant surprise present for their 50th anniversary. Atmospheric photograph of this father, son and their old lab out shooting. My weathervane based on the photograph. The Robertsons on their new bike. Bike - The Robertsons on their new bike weathervane. With an old two furrow plough on the back and his collie up front made a nice weathervane. This very old photograph shows a young farmer and his brother on a Lanz Bulldog tractor. Many years later the photograph was dug out and sent to us to make his retirement present weathervane. An ex submariner's wife supplied me with this old photograph of the submarine he served on during WW2. And she commissioned us to make this surprise retirement present for him. This customer's father served in the merchant navy on The Rigdove with the Atlantic supply convoys during WW2. This was the weathervane we made for him. This lady asked me to take some photographs of her while she was competing at Burghley Horse Trials. I made this horse and trap for her from one of my photographs. This wife found a very early photograph of her husband competing in a cross country (in a wooly jumper). From which I made this house sign for them. enabled me to make this similarly simple yet effective sign. and another effective stables sign. and my shop sign for which I also got given a few smoked hams! This guy turned up at our workshop on his Harley so I got him to pose and took his photograph. Another Harley photograph, - this one customised. and the sign I made for their farm. Jacob's sheep and Rowan trees sign for the farm. Austin 7 model photo emailed by vintage car restorer. Geoffs bus, - that's him at the front. Geoff's bus double decker weathervane. Enabled me to make this large, highly detailed weathervane of it. The village church on the green. And the sign I made for the lady whose farm house looks across to it. Photograph supplied by wife to immortalise her husband on a weathervane for his birthday. He later thanked us for the weathervane and his flattering, less double chinned profile! This wild duck arrived and stayed on a farm in Shetland and became adopted by the family. This is the subsequent wild pet duck weathervane they asked us to make. We were supplied with this father and son stargazing photograph. From which we made this striking father and son stargazing weathervane. This mother had four sporty young children. So she got them all to pose for photographs and this is the weathervane I made of them. The mother of these five boys supplied me lots of photographs of them playing. We then designed and made a sign for her new home which she decided to name 'Tranquility House'! This pair of Dachshunds are about to be immortalised. By being placed on the broomstick of this glamorous witch weathervane. A nice and alert Irish Terrier photograph. Classic Pointing stance by this Vizsla. Three photographs of this couple and their old lab. They sent us a photograph of their freshly installed weathervane (on an Apex bracket). From a selection of photographs we made this Weimaraners and Westie sign. produced this portrait of the customer's Norfolk Terrier. The daughter of the original Daily Mail Fred Bassett cartoonist supplied us with this book. From which we made her a weathervane which was nicely installed atop her garage ridge. A relative newcomer on the cartoon and cuddly toy scene is Boofle whose creator contacted us with this image. From which we made this weathervane for him. Nice calm photo of this couple's yacht. With a nice weathervane following. French family on their bright red sailed yawl photo. Distinctive rigged French yacht weathervane. Old photograph of a ketch. Ketch weathervane in front of a lovely cirrus sky. Old photograph of a Salscombe Yawl. Salscombe Yawl from photograph as a house name plaque with cut letters. Wife took this photograph of her husband (waving), leaving Amble harbour on a calm summer morning. And this is the fishing boat weathervane we made for him. Customer's Bentley 8 litre tourer. Landrover similar to customer's (can't find his original photograph). Jaguar XK 120 (I think) on a hanging bracket sign. This was the original but no longer there, Three Tuns Pubs sign that the customer converted into a house. This was the slightly more subtle house name we made for her new home. This was a lovely sketch supplied to us as a suggested layout for a family themed new house sign. And a multi-themed 4 ft. width sign with family, landrover and animals. Another customer's sketch for their farm sign. And the farm sign we made from their sketch. This was a customer's prize cockerel that she wanted immortalised. Picasso's 'Two Women Running On A Beach' painting. And my weathervane interpretation that I was asked to design. (Followed by a matching sign!). From which we made a sign for his fishing lochs. This Chelsea Pensioner at the flower show recognised his mates in a sign I made from a photograph of them on a bench. Rod happy in his work. or click here to contact us and get the ball rolling now!